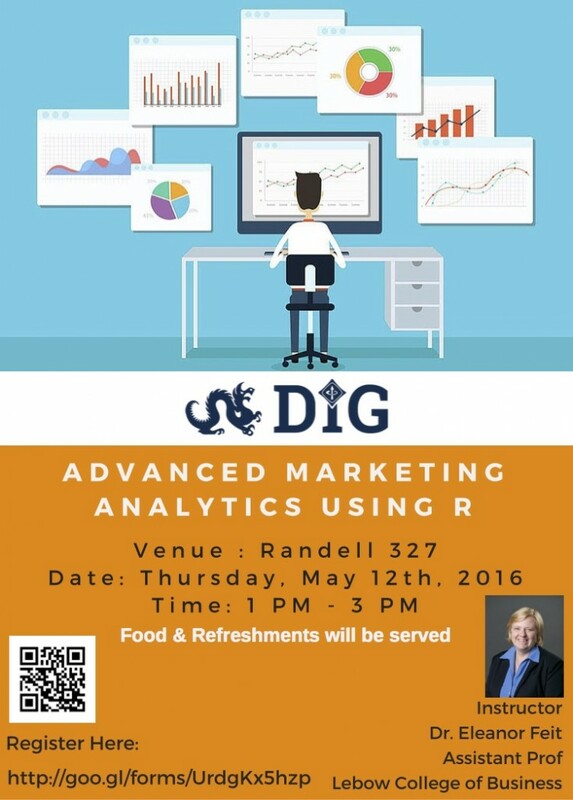 Drexel IEEE Graduate Forum presents Advanced Marketing Analytics using R by Dr. Eleanor Feit , Asst Prof at Lebow College of Business. Elea McDonnell Feit’s research focuses on leveraging customer data to make better product design and advertising decisions, particularly when data is incomplete, unmatched or aggregated. Much of her career has focused on developing new quantitative methods and bringing them into practice, first working in product design at General Motors, then commercializing new methods at the marketing analytics firm, The Modellers, and most recently as the Executive Director of the Wharton Customer Analytics Initiative, where she built the academic-industry partnership program. She regularly teaches popular tutorials and workshops for practitioners on marketing experiments, marketing analytics in R, discrete choice modeling and hierarchical Bayes methods as well as undergraduate and MBA classes in data-driven digital marketing. She holds a PhD in Marketing from the University of Michigan, an MS in Industrial Engineering from Lehigh University and a BA in Mathematics from University of Pennsylvania.